WASHINGTON — Much of the criticism aimed at the Trump administration’s Space Force plan is that it creates an expensive new bureaucracy that the Pentagon does not need. Deputy Secretary of Defense Patrick Shanahan agrees that the Space Force overhead is a concern, but it’s a relatively easier problem to solve than figuring out a new model for developing and procuring space technologies. President Trump ordered the Pentagon to stand up a new military branch for space, and Shanahan is overseeing the drafting of a legislative proposal to establish a Space Force. 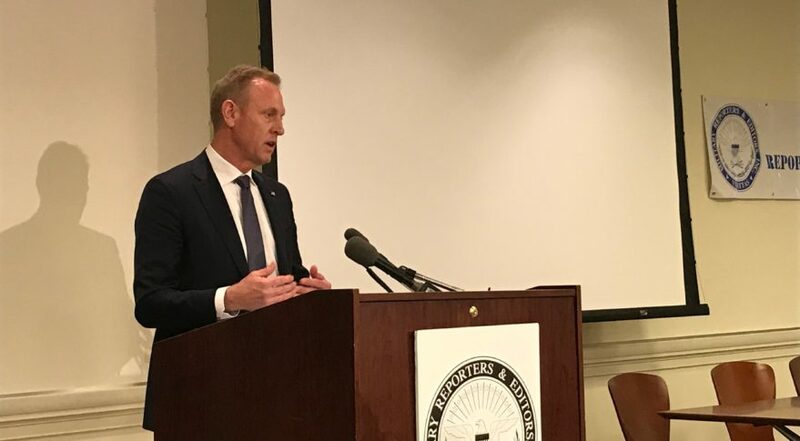 Speaking on Friday at the 2018 Military Reporters & Editors conference, he said his focus now is on how to “deliver effects and capability” in space. There is broad agreement that the U.S. military has to modernize its space systems and make them more resilient for future conflicts where enemies might target American satellites. But there is a heated debate on “how” to do that, said Shanahan. Shanahan envisions the Space Development Agency will have a technology focus but also will help to consolidate duplicative space projects pursued by individual services. “How do you align the department so we don’t solve the same problem multiple times?” he asked. The Space Development Agency would be a clearinghouse for commercial space technology, and for figuring out how to apply that technology across DoD, not just in a single service. That said, “I don’t think there’s going to be ‘budget hits.’” But there will be changes in how funds are allocated. “You’ll see Gen. Murray saying, ‘SDA we’re going to let you do the systems engineering.’” He said the current practice of each service developing its own solutions has to end. Shanahan did not provide a cost estimate for the Space Development Agency or for the Space Force at large. Asked if he agreed with an Air Force estimate that organizing a new branch and combatant command would cost $13 billion over five years, Shanahan said the numbers are still being worked out. The cost will depend on “how fast do we want to go? How many pieces of the organization do we want to move simultaneously?” The Pentagon believes U.S. Space Command and the Space Development Agency should move first. The cost of the Space Force could become a flashpoint in next year’s budget because the new service will have to be funded with existing resources. Trump has ordered spending cuts across the federal government. The president said the national defense budget will not exceed $700 billion in fiscal year 2020, while the Pentagon had projected a $733 billion topline. The national defense budget includes the Defense Department’s budget and also covers other expenses related to the nuclear arsenal, intelligence and law enforcement. Shanahan said he is drafting two spending plans: one with a $733 billion topline and one with a $700 billion budget ceiling as directed by the White House. This will set the stage for a lot of horse-trading between the Pentagon and the Office of Management and Budget, including how to pay for the Space Force.